Finally, the developers have started to publish some details of the next important 0.13 update. The new update must contain The End, Ender Dragon, Redstone (? ), finalized hell, and more! The first news was the announcement of the Q&A-stream, where developers will answer questions from players about 0.13. But of course, you would like to see some screenshots. 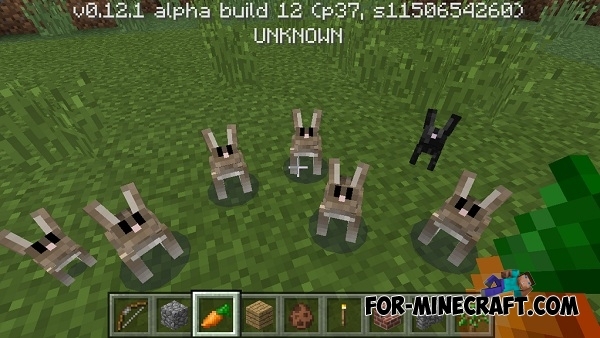 Tommaso has confirmed that will be added the rabbits to Minecraft PE. But they will be somewhat different from the PC version. Rabbits will be smaller, run away from you, can be killed with one shot and spawn only in the forest. As well as rabbits are stealing carrots from your garden! Well, we can only wait the stream, after which we will share with you a list of changes 0.13!